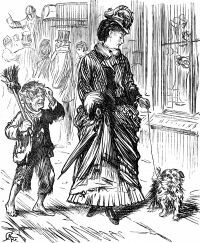 Illustration from Punch Magazine ca. 1870. The career market used to be open a little wider. Greed and politics are narrowing our options. As I struggle to find means to support my family and pay my student loans, people often reassure me that I am worth hiring and will eventually find the place where I belong. These days, I don’t know that there is such a place. Twenty years ago, I would have endorsed these ideas. Today, I see them as luxuries best afforded by the rich. These days, we just do what we need to do to survive. It is easy to think of the place that is the right fit when things are going generally right: you have a savings account, health insurance, possiblye a well-grounded spouse who can make sure the bills are paid. It is harder when all your bills are due today and all your money is in the future. The job that is the right fit seems increasingly a product of privilege. For my part, I am preoccupied with survival. I am living Maslow’s Hierarchy of Needs at this time, even though I view this and most other hierarchies with some healthy skepticism. Today is about having money for groceries and the mortgage. A rewarding job that pays for luxuries is a pointless fantasy. Combine this with my distaste for profits and corporatism, and likely, any such job will cross one or more of my ethical boundaries. In short, a career that is a good fit seems like a bourgeois notion to someone living an ever more proletariat sort of life. The thing is, as I work through my disappointment that my own feelings of privilege for the first half of my life have resulted in disappointment here in the second, I have to face some middle-class guilt (despite not being able to afford to call myself middle class any more). Because I have taken the same things for granted as have all the folks who have so much faith things will work out well for me. Personal responsibility works well for a person but not so well for people. When it comes to people, poverty is and always has been the mainstay of our existence. And we live in a place that disadvantages particular groups of people systematically, ruthlessly even, and then blames their failure on personal responsibility. These are folks for whom the middle-class dream of a good education followed by a rewarding career that matches our talents and desires is likely permanently out of reach. Even should our economy recover to pre-2007 levels, really the time when unduly privileged people really started to feel the pinch and get faced with the same economy as everyone else, for some segments of our population, there is no reason to hope things will improve markedly. We can go on being distracted by immigration crises that are really humanitarian disasters, by foreign politics and wars, by celebrity mishaps, by fake legal battles to which the answers are humanly obvious—or we can attend to the fact that most people who live here do so out of the spotlight. Migrant farm workers are not going to benefit markedly by an improvement in the economy. The estimated half million people currently incarcerated for petty drug offenses will not benefit. Just those of us on the cusp of middle class who lament our privilege in public but in our deepest hearts really want it back. I would rather be planning my vacation or my next trip to China than canceling my health insurance because I can’t afford it. But this is reality. Like most other Americans right now, things are bad and getting worse, with no real hope in sight. The real crime here is that the misery is not evenly distributed. The war on drugs targets poor (colored) neighborhoods. Poverty targets people of color. Crime targets people of color. It is easier to get a job if you are a Caucasian with a prison record than a Black man without one. My best hope is that we middle classers moving downwards might increase solidarity among our poor. The statistics do not support such optimism. But that is what blogs are for.